Home » Heart Energy » Can You Use Heart Energy to Manifest a Relationship? When you attract others to you with heart energy, you can attract those who are of like-mindedness. Learning about them and being at one with them can attract relationships to you that will help you gain strength and confidence in your abilities. Knowing things that you need to know that will help you to learn more about your life and about your possibilities will also help you to find others who are of like-mindedness. Many times they say that opposites attract. And yes, it is true that there must be opposites to some degree, but heart energy does not see an opposing faction as an attraction. Heart energy only sees other heart energy and attracts that energy to it. If you send out heart energy and you find no one around you who is of like-mindedness…, you cannot feel their heart energy…then it is your duty to step outside of where you have always been, have always gone, and try to find those who are of like-mindedness such that you can feel their goodness. In doing so you might manifest a relationship that you would like to be a part of. It does not always mean that you must physically move from where you are to find those who also are sending out heart energy. Please remember that energy flows through all things. Just like Superman can see through buildings with his X-ray vision, heart energy can move through all types of products including lead walls. It can go through all things. You may be able to stay stationary, send out your heart energy, and meet energy that is coming from others who are doing exactly the same thing. Eventually you will get to where you need to be such that you will be in the same place where they are at. At that point you will find heart energy, love energy, and you will meet that attraction and see then if a relationship can form. Relationships are a two-way street where you must have someone on the other side coming towards you. Although you are moving on your path, there are people moving towards you on their path, but it is a matter of finding ones who are of like-mindedness and whose path is not necessarily crossing yours, but is parallel so that you may be able to reach out your hand and touch them and know that they are there. In the relationship that you are trying to build and that you are trying to manifest, there must be a place in time for this to occur. As soon as that time happens, as soon as you are there, as soon as you have walked down the path that you have needed to walk to find this place in time, the relationship will manifest for you. Please remember that free will is very important. You still have choices to make once you meet others with expanding heart energy to decide if they are someone you want to have certain relationships with. Meeting people and knowing them is one thing. Deepening a relationship is something totally and utterly different. It is something that is again part of your free will to determine if you want to continue with that relationship or not. If you want more information on heart energy, manifesting a relationship, or the Law of Attraction for love, check out the pages below. What is the Best Way to Manifest What You Want? Wow! I had heard of heart energy but knew nothing about it. I feel very convinced. Everything takes practice but if you give yourself time to work on a new technique it will pay dividends so I will use this one daily! Thanks for sharing this! I love seeing lightbulb moments like you just had Joey. The more you practice heart energy, the easier it will be…to the point where you won’t even have to think about it to use it daily. It becomes as natural as breathing. I hope you have fun watching the wonderful results of using it! I have been reading this website for 2 years this month; which was when my dilemma started. I am not clear on the point that is being made here. What really is heart energy? How really is it administered to help solve relationship problems? My apologies for seeming blunt or aggressive, but when you tell the story; tell it right. I have been led all over your site, to Amazon, etc. and still can’t comprehend how you used heart energy to get a specific person. Elizabeth’s book was pretty clear to me. You don’t use just heart energy. Maybe that’s your dilemma. Instead of trying to understand things intellectually, allow yourself to just do it and I’m sure you’ll see that it’s easier than your mind is trying to make out. That’s one of Elizabeth’s major points. Don’t use your mind to manifest. It’s what’s holding you back with heart energy. Turn it off and stop trying to understand. Just do. Just be. In this article, you mention that people have to be of like mindness. Does this mean if I”m trying to attract a specific person with Heart Energy, but they are not coming towards me, it will not work? Like if they are not ready for a relationship, or in particular a relationship with me? This article is about how to manifest a relationship in general, not a relationship with a specific person. 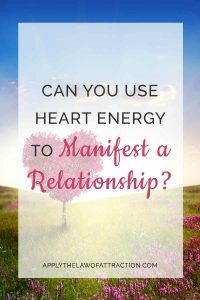 I explain how to use heart energy to manifest a relationship with a specific person in my book, Manifesting Love. Am trying to attract my ex for more than a month now , I am doing all the right things and I believe with no doubt in the law of attraction, he started contacting me rarely after along time of not talking at all ,but still didn’t say he wants us back. So please give me some tips from this book that would make him come back to me.